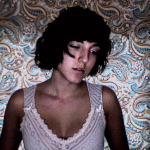 Do you need a cultural fix but can’t wait until First Friday next week? The Trunk Space can provide you with some entertainment this Friday. 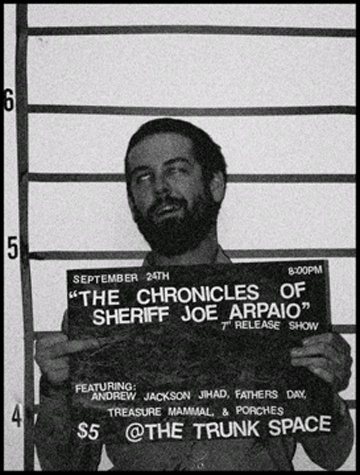 The venue will be celebrating The Chronicles of Sheriff Joe Arpaio 7″ release show with Andrew Jackson Jihad, Treasure Mammal, Porches and Father’s Day. Yes, you read that correctly: A record about our infamous sheriff. Each band wrote a song about Sheriff Joe for the record, which will be on sale that night. The 7″ was put on eBay and proceeds were given to No More Deaths, a coalition that works to end the suffering and death of migrants. Still not intrigued in going? Hear about the lineup. Andrew Jackson Jihad is a Phoenix-based band that has made quite the name for themselves beyond our state. Members Sean Bonnette and Ben Gallaty have made a genre of their own with their folk-punk sound that seems to have gotten bigger since the band’s inception in 2004. 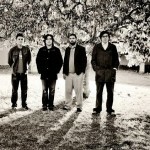 They have released more than 15 CDs, EPs and splits. They’ve been featured as “one of the bands to look out for” in Alternative Press and have definitely lived up to that standard. When you hear Andrew Jackson Jihad’s lyrics, it isn’t surprising that they are appearing on an Arpaio-themed record. They just finished a U.S. tour with Blunt Mechanic and will be kicking off their European tour with Kepi Ghoulie from the Groovie Ghoulies in October. Treasure Mammal is a one-man band with a crazy, funky-techno sound that meshes with the hijinks of Tim and Eric’s Awesome Show. Abe Gil’s stage outfits are as crazy as his music, with unicorn costumes and a wide range of unitards. Father’s Day is a four-piece punk/thrash band that doesn’t take themselves too seriously. 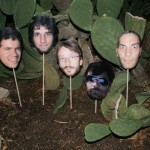 Douglas Patton, Frank Brando, Juan P. Mendoza and Andy Denver, like Andrew Jackson Jihad, have made a name for themselves by playing at the Trunk Space. Not only will the music be something you’ve never heard before, but the show will also be something you’ve (probably) never seen before, with folk-punk, crazy techno and thrash all playing under one roof. The show starts at 7:30 p.m. and is a whopping $5. 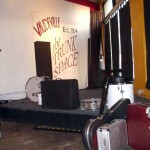 The Trunk Space is located at 1506 Grand Ave.